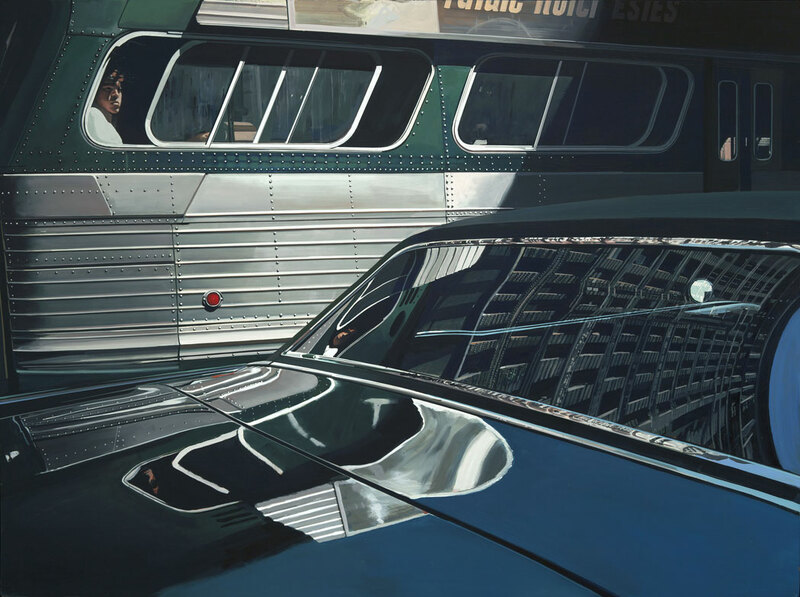 Richard Estes is one of the leading photorealist artists of the twentieth and twenty-first centuries. 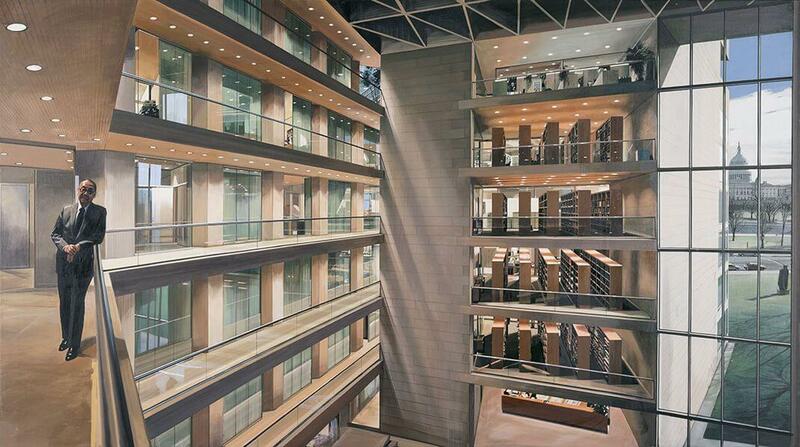 His meticulously painted works are done from his own photographs, which he combines to create reflective cityscapes, landscapes and seascapes. Richard Estes was born in the small city of Kewanee, Illinois in 1932, the oldest of two sons. Estes father ran an auto repair shop in Kewanee and moved the family to larger city of Evanston, just north of Chicago. 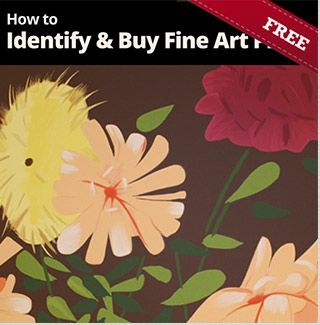 Estes exhibited artistic creativity when he was quite young. He was interested in painting, drawing, photography and model making and planned to study architecture after graduating high school in 1950. He took a job at an insurance company for a year, saved some money and took a trip to Europe. The trip through Europe, where he visited museums and galleries, motivated him to study art instead of architecture. He returned to Chicago, applied to the Art Institute of Chicago and completed his Bachelor’s in Fine Arts in 1956. Estes moved to New York in the summer of 1956, worked for a short time at an advertising agency, then returned home to Evanston to save some money for a return trip to New York. During his time back home, Estes honed his artistic skills, and returned to New York in 1959. He became a successful graphic artist, whose work appeared in Popular Science and other publications, as well as on record album covers and book jackets. Estes continued to take photographs of the city and paint at night and on weekends. By 1966, he had saved enough money to paint full time. 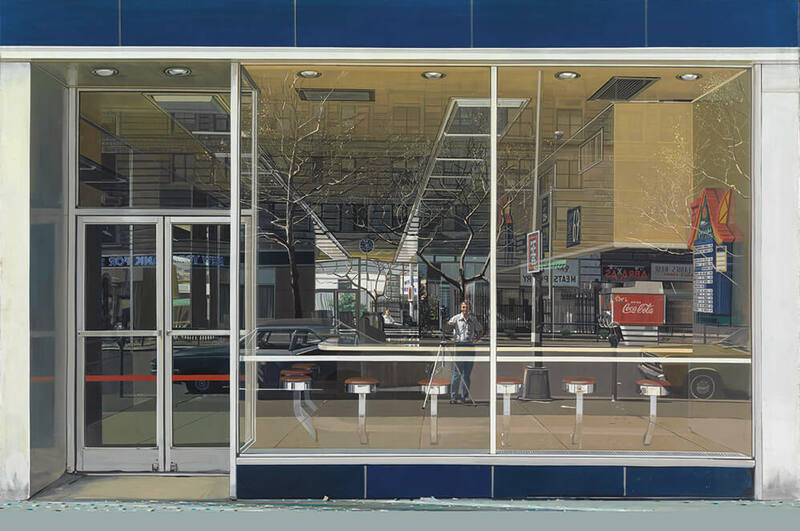 He created a body of work based on the photographs he took of New York city neighborhoods. 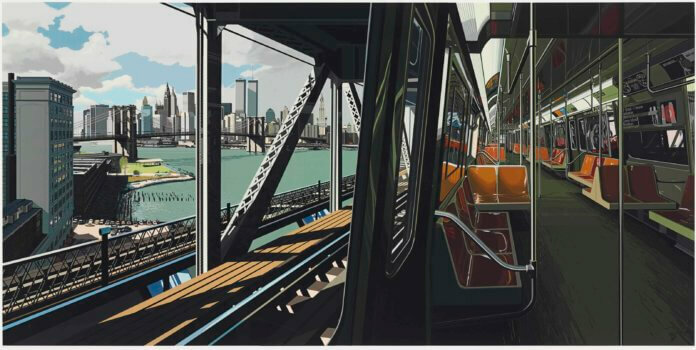 His paintings are composites of photographs, which appear to be actual locations but are actually compilations of images, which he composes to create city, land and seascapes, often paying homage to the compositions of American and European masters. In 1968, Estes went from gallery to gallery, trying to find a place for his work. His last stop, the Allan Stone Gallery, gave him his first solo show and his career took off. In 1971 he received a fellowship from the National Council for the Arts and was elected into the National Academy of Design. Estes spent much time in Europe, creating paintings in France, Italy, Spain and even Antarctica. 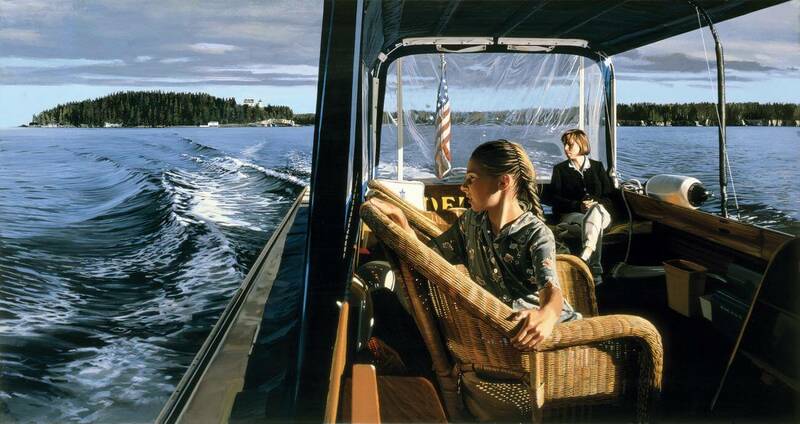 He divided his time between his studio in New York and his studio in Maine, where he began to do more seascapes and landscapes and he began to introduce figures in many of the works. Richard Estes work is part of the permanent collections of the Smithsonian, MoMA and other major museums and galleries around the world. 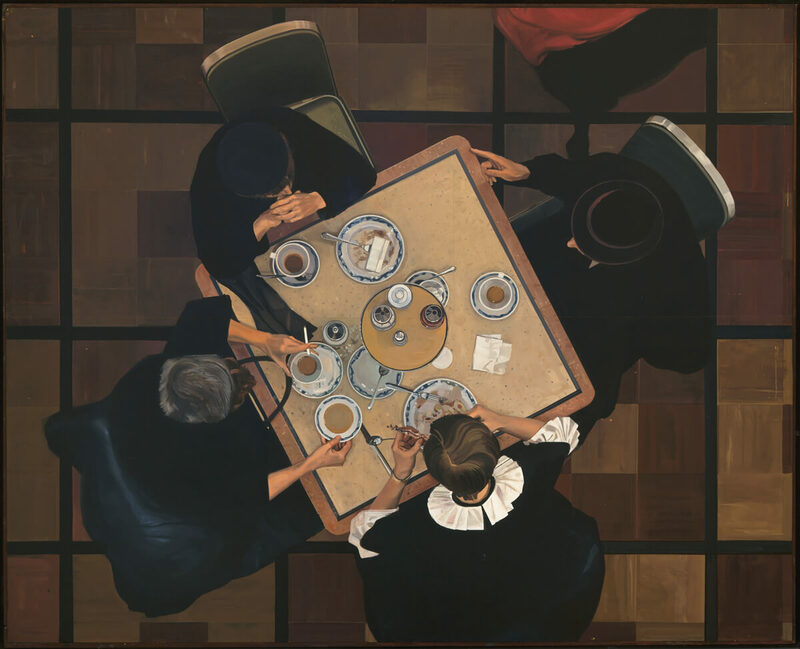 He continues to paint in his studios in New York and Maine.